The Elternitiative project office was opposite St Anna Kinderspital and was nice and easy to get to by the efficient underground. A group of us (Me, Mick, Jude and Willie) met up with Matt at the underground station. Ali and Emma had made their way on foot. 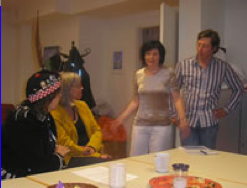 We were met by Susanne who I had communicated with, a volunteer and parent involved in the project. Susanne went to track down Darius, Brian and Ally who had gone into the actual hospital and brought them to the office. Susanne explained that two of the young people who should have been for computer training were too vulnerable to be in amongst people due to their reduced immunity. We met 3 of the young people doing the training and one boy Stephan was trained as a sort of facilitator, as was one of the parents. The tutor (also called Stephan) told us how much he enjoyed his job and how rewarding it was when the children brightened up when he went to the ward to do some training. He explained the huge benefits the training had for those undertaking it. We persuaded Darius to play something on the pipes and he was in great demand for some photos. 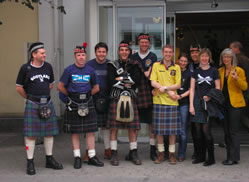 After I handed out some Austria/Scotland badges, we went outside to the front of the hospital for more photos. The Viennese were very courteous and stopped in their cars while everyone took turns standing in the middle of the road taking photos. They may just have been curious about a gang of kilted up Scots. Susanne invited us to make another visit if we were back in Vienna. We will, of course, be back in Austria next year!!! !